I admire those writers who have outlined the entire histories of the worlds their stories take place in, who can describe every culture present in detail and even had the wildlife and geography of their entire world planned out. I am not one of those writers. I used to think that I would be, but eventually I’ve come to realize that the thought of planning out a world in absolute detail stresses me out. That’s not to say that I don’t enjoy world building. On the contrary, inventing cultural practices, animals, places and historical events is one of my favorite parts of writing. But when I build worlds, I do it on a “What do I need to know?”-basis. That doesn’t necessarily mean that I only add details that will actually be written out in the story in question, a lot of it is “behind the scenes” stuff, the sort of thing that I want to know when writing even if the reader never finds out. Lately I’ve gotten pretty good at improvising up facts. If I’m mid-flow and I realize I need to add some detail (name of a town, character’s favorite drink, whatever), I’ll try not to stop and think too much and instead just go with whatever comes to mind. The thing I do need to get better at is actually writing down the facts about my worlds in a comprehensive way. I mean, of course I can just read through the story and find it that way, but I like the idea of having a sort of “master file” for each of my worlds that I can refer to, particularly because most of my worlds contain more than one story and it just gets to be a hassle to look through a bunch of novels just to find out what someone’s eye color is or what a country’s capital is called. I want to try to have a file like that for the world that Going Home takes place in by the time it’s on Kindle, so that I at least have the “canon” facts of that world collected in one place. 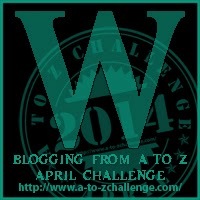 This entry was posted in Blogging from A to Z, The Following and tagged blogging from a to z, going home, on writing, planning, the following, worldbuilding by Emma Lindhagen. Bookmark the permalink. Next → Next post: X is for Xena, naturally!